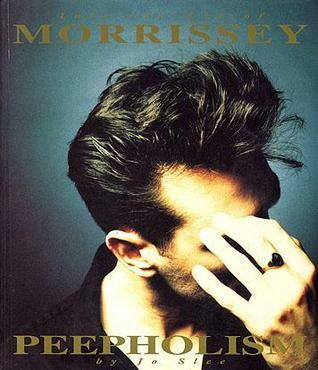 I remember finding "Peepholism: Into the Art of Morrissey" by the singer's co-designer Jo Slee at a local Virgin music store in Hollywood, and I never bought it, but I always looked through the book on a regular basis whenever I visited that store. One day I arrived, and the book went missing or got sold, and ever since then I have been thinking about obtaining this book. Morrissey, in a nutshell, is a fascinating artist. Of all his talents, and songwriting is one of them, but I also love his sense of design and thought that into his graphics for The Smiths. Jo Slee worked with Morrissey on the visual side, and it's fascinating how he had brought up a distinctive gay or/and pop culture through his work. I believe the images he uses or presents is just as important as the music. His time with the Smiths was the best, visually speaking. I prefer the solo Morrissey than the Smiths music, which I know is a sin to the average Smiths fan, but on the other hand, his work as a graphic artist/designer is superb during The Smith years. His use of actors such as James Dean, Albert Finney, and various British iconic comedians, pop star great Billy Fury and so forth is used as a language to describe an inner world that is very Morrissey specific. In a manner, his work reminds me of Sgt. Pepper cover, due that one thinks how do these faces in the background connect to the Fab Four. One feels the same way when approaching a Smiths cover. Once Morrissey went solo, he pretty much eliminated having another face or person on the cover beside himself. That, I also found interesting that he made this huge change when he went solo. A difference is good, but, the intensity of The Smiths graphic is exceptional in design and mind. "Peepholism" is not the perfect Morrissey graphic book, or on its subject matter. It would be nice if a cultural critic/historian did a book on just Morrissey's graphics world, nevertheless, "Peepholism" is fascinating in parts, and I'm happy that I eventually found a used copy.